I swear this has to be the EASIEST recipe EVER for lunch or dinner! And it's SOOOOOO good!! I bought the salmon from Costco. It was about 3 lbs of it. Made it for dinner and Monday and have been having it for lunch all week! The kids loved it too! 1. 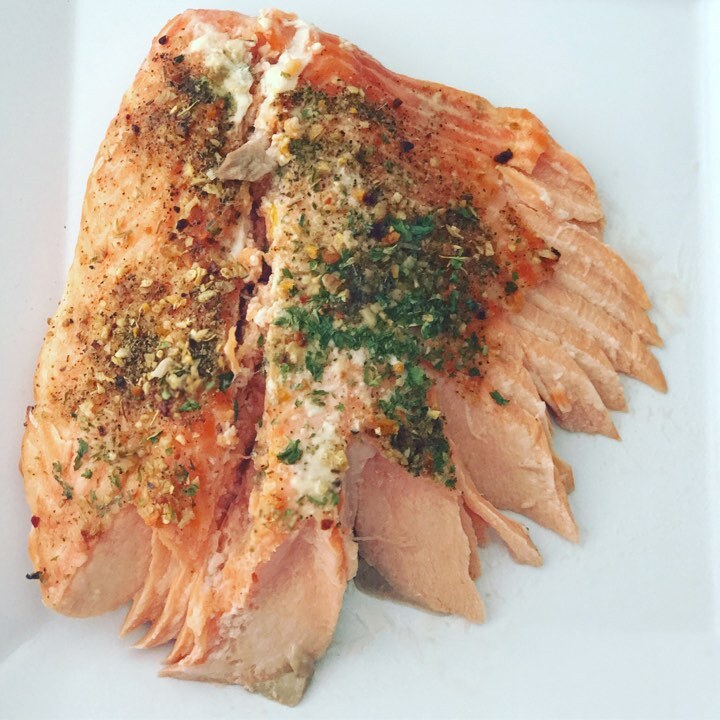 Place the salmon on a cookie sheet with a baking rack on top. I like to make it on the rack because most of the fat falls into the cookie sheet and the salmon doesn't cook in it. I leave the skin ON while cooking. Make sure you spray the rack so it doesn't stick. 2. Squeeze fresh lemon or lime juice on top of it. As much or as little as you'd like. 3. Sprinkle with Kirkland no salt seasoning and parsley. Rub it in. 4. Bake at 375 for about 25 minutes. 5. Remove, let cool and ENJOY! We ate it with baked sweet potato and steamed Normandy veggies topped with Gorgonzola cheese.